Vi spiste på restaurant i går kveld - utrolig god mat og priser på nivå med den nederlandske delen av øya. Kenguru-biff hadde de på menyen, som Nigel valgte. Dette var helt fantastisk og bare femten euro! I dag har vi endelig byttet de to tomme gassflaskene våre (se dagens øverste bilde). Butikken hadde fått inn flasker i dag - og de gikk unna som varmt hvetebrød! To andre kunder tok med seg flasker bare i løpet av de ti minuttene vi var inne i butikken. Det sto igjen kun fire flasker på hyllen, men de har kanskje mer på lageret. Vi er iallfall sikret nok gass til vi kommer til Azorene, men vi skal prøve å bytte den tredje flaska vår, som er ca. halvfull nå, rett før vi seiler til Bermuda. For de som ikke er klar over den vanlige reiseruten tilbake til Europa har jeg tegnet det inn i dagens nederste bilde. Her ligger nå både Dream Catcher og Helmax - tett inntil oss innerst i havnen. Vi har alle vært ombord Dream Catcher for litt vin, og skal ute og spise sammen litt senere på kvelden. Nigel er fornøyd med formiddagens aktiviteter. Nigel seems pleased with the morning's work. Our route across the North Atlantic. We ate out at a restaurant yesterday evening and were served the best food we have eaten since we were in Europe. The prices were reasonable, about the same as on the Dutch half of the island. They had Kangaroo meat on the menu, which Nigel chose - it was fantastic, and very reasonably priced at 15 euro. 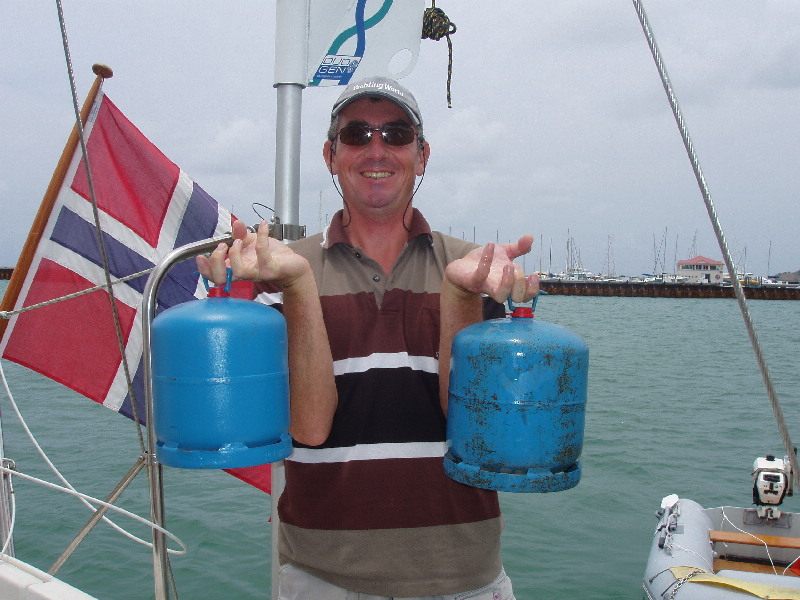 Today we have finally exchanged out two empty flasks of Camping Gaz - see today's upper picture. They were selling like hot cakes too. In the ten minutes we were in the shop two other people were there exchanging and when we had taken our two, there were just four flasks left on the shelf, though they may of course have had more in the warehouse. This should keep us going until we get to the Azores, though we will try and exchange our third flask, currently about half full, just before we sail north for Bermuda. For those still unsure of the normal route back to Europe, I have drawn it on a map in the lower picture. Both Dream Catcher and Helmax, two Norwegian boats we know well, arrived this afternoon, and we are all at anchor close together in the innermost part of the harbour. We have been on board Dream Catcher for afternoon wine, and will soon go out for dinner together.